ENERVEX was a participant in this $650 million mixed-use development. Due to aesthetic goals and space limitations, the six condensing ClearFire water heaters had to be common vented 150 feet through a large parking garage to the outdoors. A venting project this complex and of this magnitude clearly required the expertise and track-record of someone like ENERVEX. A PowerStack EPS1 Chimney System with six 16" connectors & one 36" common stack with graphite gasket sealed joints, listed to UL1738 and pressures up to 60"WC and temperatures up to 1400 degF. A TDF 620 Power Venter inline fan with variable speed and an EBC 30 Modulating Controller to monitor and maintain perfect draft. Six 16" Modulating Overdraft Dampers to control the connector draft for the individual water heater. Little Caesars Arena is one of more than a dozen developments launched by the llitch organization in The District Detroit since 2015. More than $1.4 billion in development is underway or planned, setting the stage for additional retail, office and residential projects. Development in The District Detroit has already created more than 20,000 construction and construction-related jobs and more than 3,000 permanent jobs after the opening of Little Caesars Arena, two-thirds of which were filled by Detroiters. These future projects will continue to grow the city's economy and create new opportunities for Detroit and for Michigan. The construction of Little Caesars Arena positioned Detroit as the only city in America that houses all four of its professional sports teams in an urban core - all within walking distance. Home to the Detroit Tigers, Detroit Red Wings, Detroit Pistons and Detroit Lions - The District Detroit represents the greatest density of professional sports teams in one downtown core in the country. Little Caesars Arena exemplifies modernization with its deconstructed model. This first-of-its kind implementation blurs traditional physical and experiential spaces, with interior streets in the street-level Via concourse acting as a retail galleria with offices, four full-service restaurants, amenities and rich history. The design highlights the Ilitch organization's focus to look beyond the typical arena to positively impact the broader community. 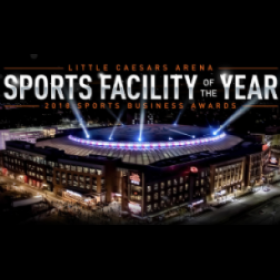 The Ilitch organization's vision for what Little Caesars Arena could be drove it to deliver much more than a state-of-the-art facility - to create something very special and highlight innovative. That systematic approach to innovation and fan experience is evident throughout the facility, including signature public and premium spaces, the BELFOR Training Center, unique heritage elements, a 600-foot long projection jewel skin, one of the largest center-hung scoreboards in the world, 3-D image mapping, a versatile sky deck, over 1,300 display screens and more. Among many other features that celebrate Detroit's great sports and entertainment heritage, the arena's upper level concourse includes its own interactive experience - The Ring of Honor, which features three touch screen monitors that pay homage to the Detroit Red Wings' 11 Stanley Cup teams, and the Detroit Pistons' three NBA championship teams. The jewel skin, also located on the upper concourse, is a one-of-a-kind video system using 12 laser projectors to turn the façade of the upper bowl into a constantly changing media panorama. It has become one of the facility's signature design elements, immersing fans the moment they arrive through programmable video and graphic content that can be quickly transformed depending on the event. Little Caesars Arena's center-hung scoreboard measures more than 5,100 square feet and is the largest seamless center-hung system in the world. It features a continuous display connecting all four sides with each side measuring approximately 28 feet high by 43.5 feet wide. Combined with the under-mount displays to appeal to fans sitting closer to the action, the center-hung display includes approximately 11 million LEDs. Little Caesars Arena features a world-class theatrical lighting package, highlighted by a first-of-its-kind LED lighting grid that provides Red Wings and Pistons players with the best sports lighting possible, and creates an active, animated ceiling for events of all types. Using the ceiling's wire mesh as a scrim, the lighting can be used to engage the visitor, create different moods and project logos, advertising and other branding.